Welcome back to What The F!#& Should I Read Friday! I totally missed last week because I was on a six-hour round trip to take my grandmother to the airport, and no I don't write my posts in advance you guys geez that would indicate an organized mind. I have not got an organized mind you guys. Don't get me wrong, there's lots of stuff floating around in here, and to the casual observer it might even look like it was all ordered according to some arcane and mystic system (right? oh god, I hope so), but really, don't ask me to plan ahead. I go all to pieces. As usual, I'm glad you asked! 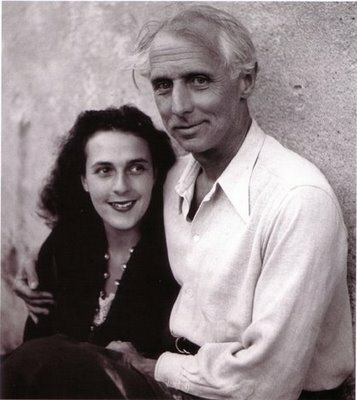 Leonora Carrington with Max Ernst. Via Cryptomundo. 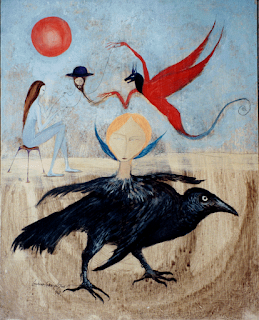 Leonora Carrington is the author of The Hearing Trumpet. She was so cool, you guys. What's crazy is that totally by accident, today is the one-year anniversary of her death. No I did not do that on purpose. She is just totally magical and if you read the book you'll realize that it's perfectly understandable that some sort of weird coincidence like that would happen to me while writing about her. Really, I just went and looked at Wikipedia and bam, May 25th, 2011. Rest in peace, madam. We're up here celebrating you. And really, kids, she is something to celebrate. So basically she was born into this wealthy British family and was a fierce rebellious gal who got interested in Surrealism early. Supposedly she saw Max Ernst's paintings at an exhibition when she was 19 and totally had the hots for him (I'm paraphrasing, okay) just from looking at his paintings, and then she met him the next year at a party in London and that, as they say, was that. As in Max Ernst went back to Paris with her and promptly left his wife. When the Nazis invaded France, Ernst was arrested by the Gestapo and had to flee (helped by another awesome woman, Peggy Guggenheim - dude, I went to her house-turned-museum in Venice, and it was amazing) and our lovely heroine Leonora was (understandably enough) really, really upset about this. Like, so upset that she fled to Spain, had a breakdown, and got institutionalized by her parents, which resulted in her getting shock therapy and having to take a lot of nasty drugs. When she got out of that mess and eventually reconnected with Max, apparently they'd both gone through so much awful stuff that that, again, was that, except this time in the yucky this-isn't-going-to-work kind of way. Max married - surprise! - Peggy Guggenheim instead. from this really fabulous online gallery of her art. see his groovy style. Via Identical Eye. 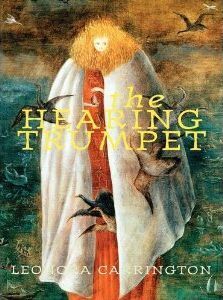 The Hearing Trumpet is a book about 92-year-old Marian Leatherby, whose family puts her in a Home for nutty old ladies that turns out to be much more than it seems. 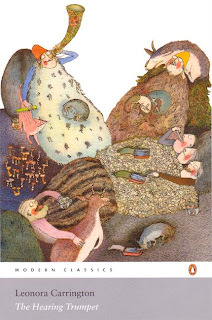 It's written from the point of view of a doddering, cheerful, ancient old hag (that's Marian) and her outlook on life is so completely charming as to make me wish that more people would write from the perspective of the very ancient. It's not her bloody reminiscences; she goes and has an epic occult adventure. It's funny and sweet and totally bizarre. It is not, however, a normally-plotted novel. Lady is into surrealism, okay; don't expect logic. It's not incoherent or "experimental" or any of those obnoxious things; it's just that the structure of the book requires a suspension of normal novelish expectations. It's sort of in thirds: in the first third you meet the characters, who are the best. I don't mean the best in the book; I mean they are the best characters, period. She's an intrepid old bat having adventures and she is hilarious and completely herself, by which I mean she is utterly alive and completely believable and not just some sort of surrogate for Leonora Carrington. She's a mad deaf thing and perfectly well aware that everyone around her thinks she's a crumbling wreck, but she's a lovely indignant person inside while still being totally old. actually pretty cool & worth reading. In the second third there's a story-within-the-story, and this is where it becomes very important that you get the edition with the cover above and not the Penguin Modern Classics edition. This is important for two reasons: one, the front cover of the Exact Change edition, above, is one of Leonora's own paintings (The Giantess, 1947); two; it is full of really fantastical illustrations by her son, Pablo Weisz Carrington, which are one part Ralph Steadman and one part Chagall. (Yes, I know I used Chagall already. That's how it looks to me. Maybe he inherited it.) They look like his mother feels, somehow. And they make the odd middle part of the story totally come alive - for me, anyway. The Penguin edition has no pictures at all you guys. It feels much more like a surreal fairytale when it has pictures. Trying to describe the plot doesn’t really do it justice, just go and read it. If you mixed a bit of Angela Carter, Spike Milligan, Agatha Christie and Roald Dahl together you might get something close. It’s enchanting and funny, and makes for a refreshing encounter with Surrealism sans machismo. Look, she says things like "“Wouldn't it be wonderful if I won a helicopter in a crossword puzzle competition? There is not much hope though I am afraid, as they never give such practical prizes." Trust me, you want to know Marian Leatherby. She is a formidable lady. Everywhere. Publicly. Preferably aloud when you get to the best bits. Although I have to say it's especially enjoyable in a green place in the sun, in my experience. Well, that's debatable, really. Especially given the ending. Ah. Well. Here's where you say I hate surrealism, it's stupid and weird and why are the clocks always f!#&ing melting that is so dumb and I don't want to read about it at all. And this is where I say don't be an idiot, there aren't any clocks in the book, way to stereotype, geez. And the reason you should read the book is because it is about a very, very old woman who still has her sense of wonder and delight left. Look, really, people will say it's about a hundred things, because it's weird and magical and has peculiar pictures and was written by a painter who was institutionalized and so on. And probably most of the things they say are right, but they're missing the point. The point of the book is being an old crone and still open to the experience of marvels and mystery. (Not to mention she still bloody well has a sense of humor.) That, my friends, is what I call a f!#&ing inspiration. You know, I've never been a huge supporter of all the Alice stuff, even if I do have a nod to Carroll in my book. He was incredibly imaginative, but he couldn't tell a story. With both Alice and Looking Glass, they just end. It's like he got tired and just stopped. And, I'm sure, that's sort of what happened. But with a greater slant toward the "I don't know what I'm doing here anymore, so I'm going to be finished now." I love the stories, myself, although i just got an anthology of his and really, NOTHING came up to Alice standards. Some of it was really awful. I'm not sure the "it was all a dream" ending was common when it was written, or at the very least QUITE so hackneyed...anyone care to tell me about the historical usage thereof?? I have a complete collection of his works, but I haven't had time to get past the Alice stuff, yet. I do love the stories. I especially love Looking Glass. I just hate how he just stops. I'm not sure if he was the first to do the dream thing or not, but it wouldn't surprise me. I'll add to my list, but my list is freakin' long. Right now I'm almost finished with the book I'm going to send you. I want to read her other book and interview her for my blog. I like her. I'm so excited! I love getting books in the mail! I so don't expect you to nominate 7 more folks, but your blog is swell and it gave me a chance to let other folks know what you have going on here is great! I'm looking for some folks to email to you in response to your Q about other interesting people for guest posts - I'll get back to you soon! Museum of Gratitude: The Kreativ Blogger Award!